Available night of 6 July ONLY. 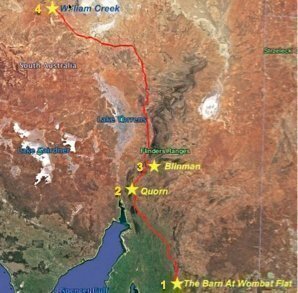 500 Miles Of Music is a lead up event to The Big Red Bash, and planned so people can take the trip in the great Australian outback and do both events. You can choose to follow the tour from start to finish by purchasing the 500 mile ticket, or just join in along the track. There are very limited tickets available at the first Venue, max of 125, the rest of the venues are outdoors, but we still have limits. Quorn will be limited to 700 . Blinman 500, William Creek limited to 1000. This makes the event very family friendly and each location has camping very close by. Concert 1: The Barn at Wombat Flat, Saturday July 6, 2019 at 6pm. To purchase TOUR MERCHANDISE, please click HERE.